I have never played an acoustic bass. Some consider an acoustic bass guitar an oxymoron. When I looked on the web for acoustic guitars I mostly found what is really a solid body guitar. 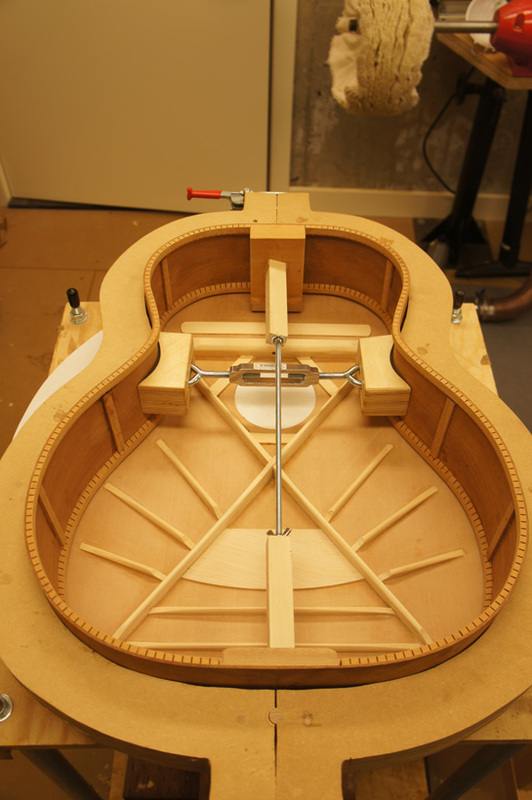 Some were made to look a little acoustic but the â€œacousticâ€� body hid what was basically a 2/4 under bridge that the neck attached to. 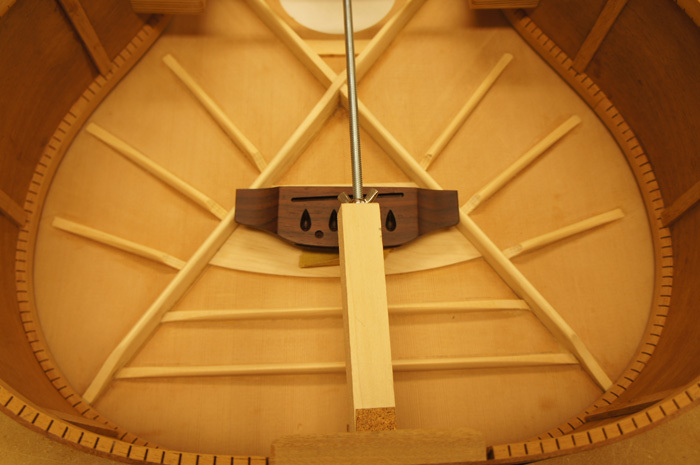 I gather that acoustic meant a piezoelectric transducer under the saddle. I wanted a real acoustic instrument. From everything I read on web it seems this guitar was the closest to performing as a true acoustic and could hold its own with other guitars. I guess to achieve this performance the guitar is ridiculously huge. Look at the last photo with it on top of a stack of two full sized radius disks. We will see I am putting a LR Baggs active element under the saddle transducer as well. I have the bracing finished and glued the back on the RIMs I still need to put the end wedge in so I held off gluing the top. 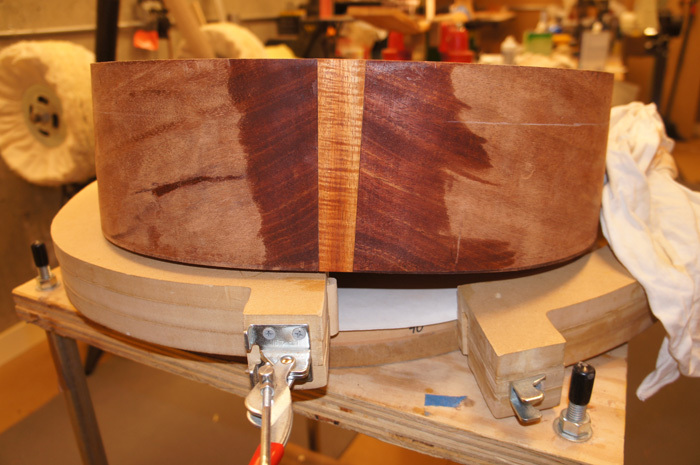 Being able to hang the rim on a board while cutting the end wedge makes the job a little more manageable. 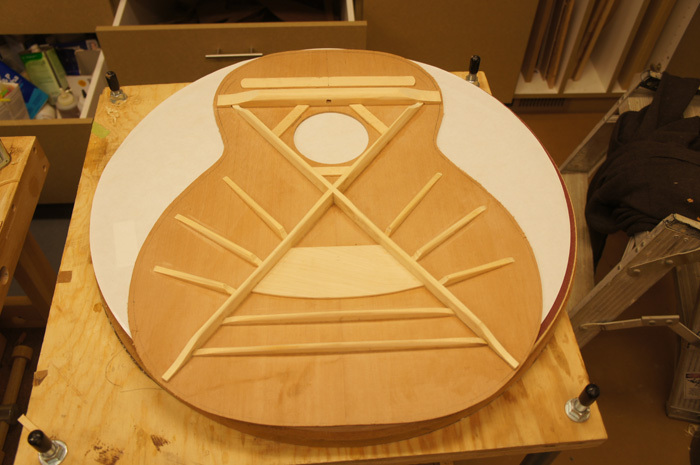 I have started to pick out the trim for the guitar. I am going to use black fiber bindings; I can put them on without bending them. For the top I will bend herringbone purflings. On the back I will use bwb purling. I decided on an ebony peg board veneer. I am going to put a veneer on the back of the peg board as well. I am still deciding on what to use. 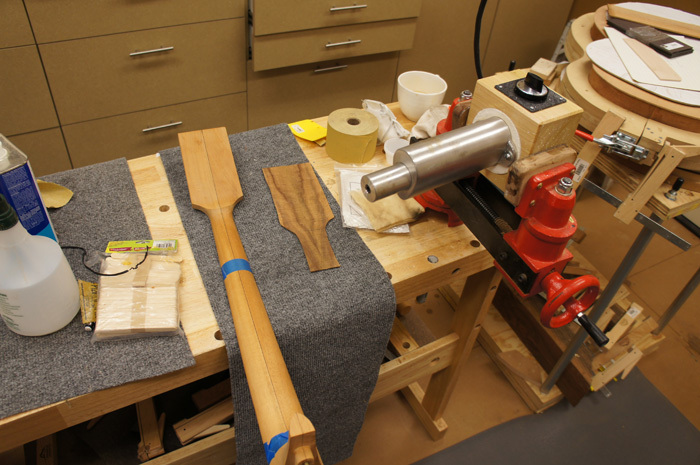 I am planning on picking a veneer and using it for the back pegboard, heal cap and end wedge. I played around with a rough peg board shape. 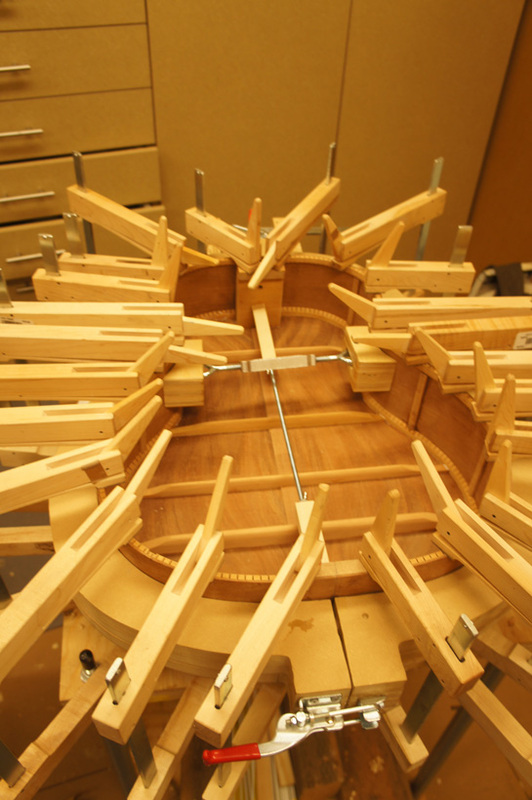 I want the strings to run straight to the nut so that dictates the shape somewhat. I included a picture of my sketch on the plans. My tuner holes are the messy Xes. I will keep the tuners the same distance from the side. 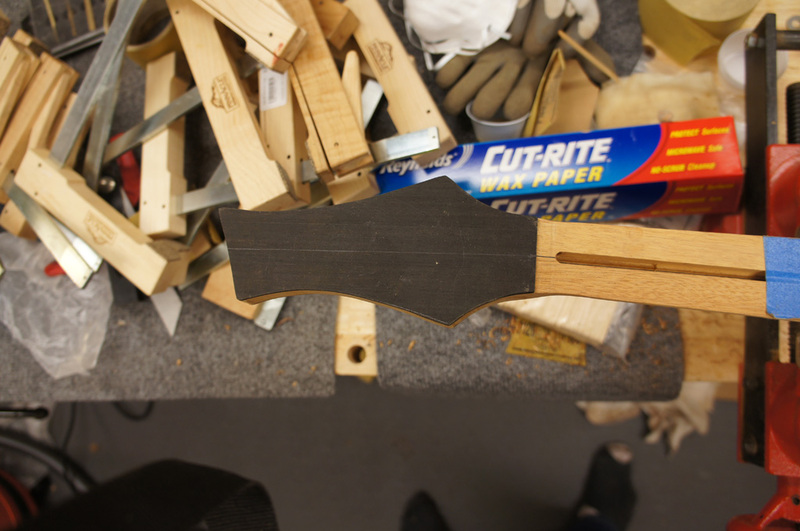 So I laid the tuning holes on the sting lines and placed a dot the correct distance toward the side. Then I just drew curves to tie all of the points together. The top bracing is a bit weird with the x-brace terminating in a massive transverse brace. It took me a bit to figure out why it was done that way. It finally dawned on me that while the guitar is oversized the bridge is not. 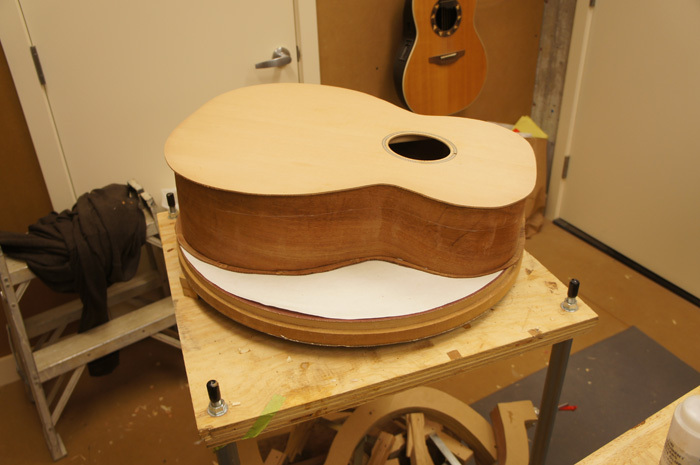 To keep the x-brace underneath the bridge and optimally place the brace under the sound hole the X hits the transverse brace instead of the rim. I tucked them into the brace. I used up every clamp I had to glue on the back. The back really fit well so I probably could of gotten by with a lot less. In any case I cannot see light coming into the guitar from the back seam. The top has a 40 foot radius with the middle 4 inches of the transverse brace flat. The top came out right where I wanted it. 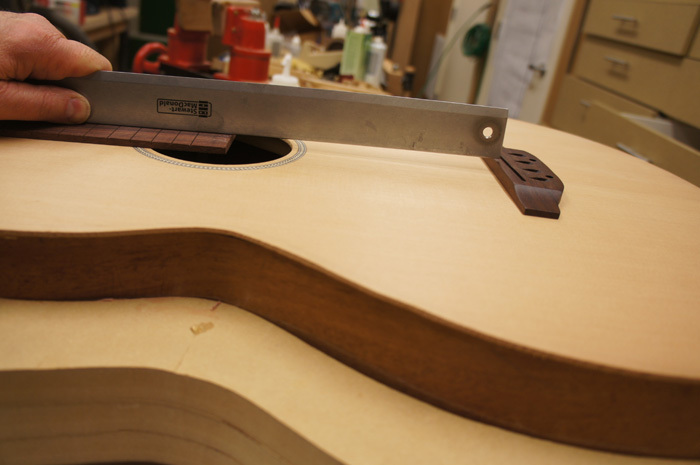 The height off the bridge with a straightedge the is just a bit above the bridge with no frets. 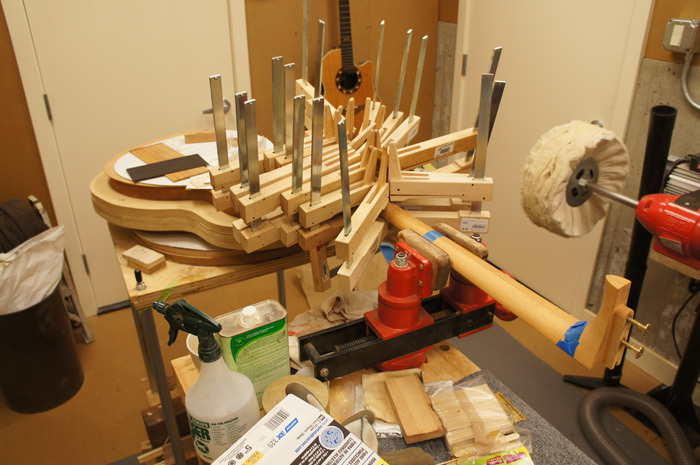 I had to think about that for awhile as I am building a fretless guitar. I thought about having a higher angle to compensate for the loss of the fret (.5 mm at the bridge). But then I decided the height of the string off the top was my first concern, secondly a base guitar should have a bit more action anyway. But really I have no idea what it ideal means when playing fretless. I guess I will find out. It is HUGE! 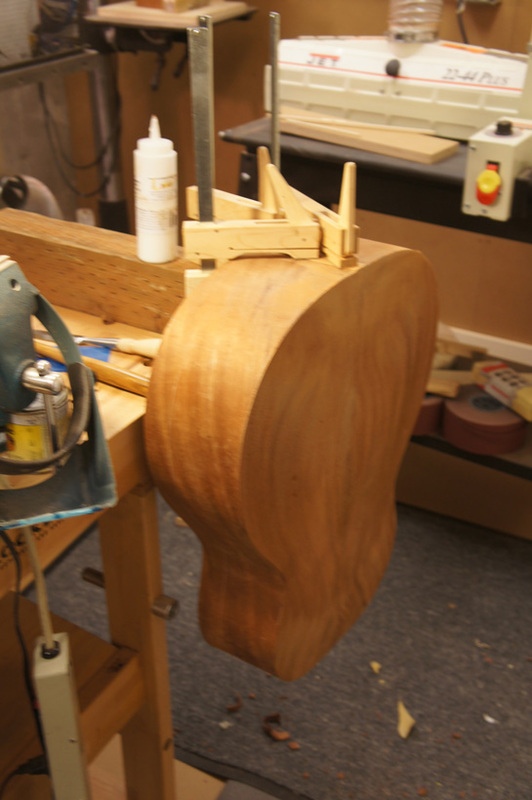 I am making a bit more progress on the Bass. 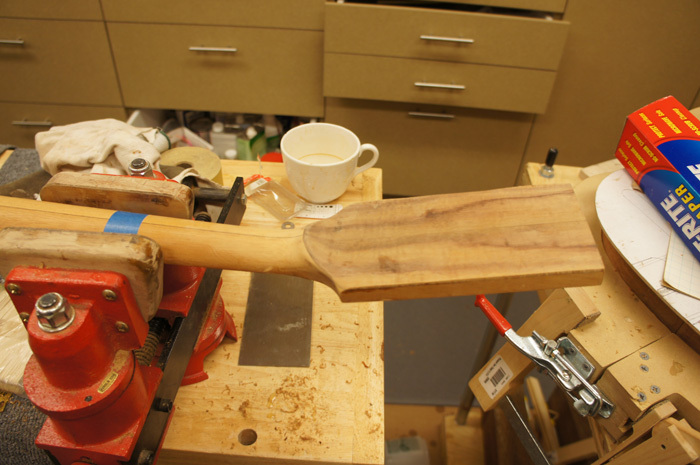 I have the end wedge in and have put a veneer on the back of the headstock. The end wedge went easy as I have made a few of them. 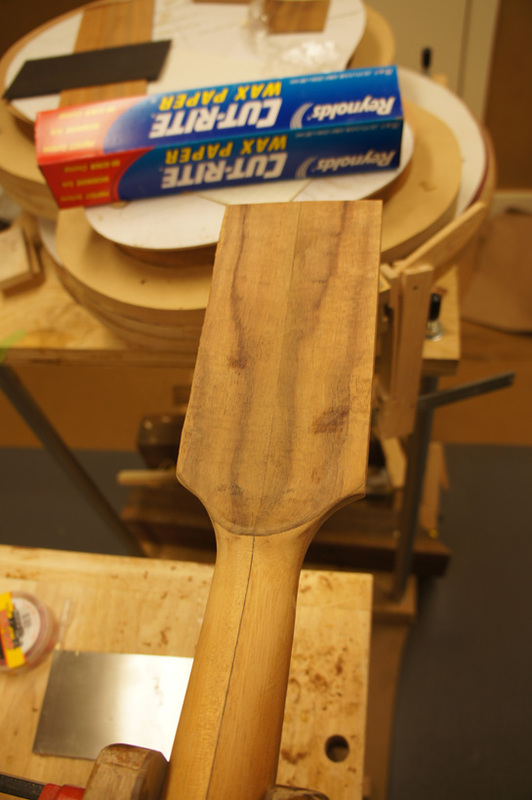 I used a bit of scrap koa, Laid out the wedge from a centerline. 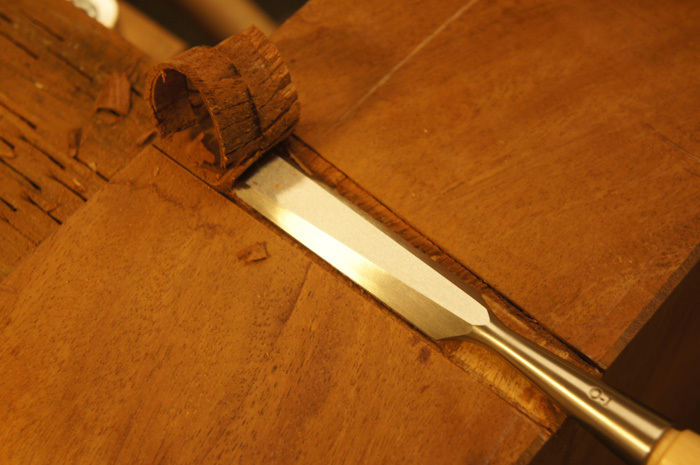 I then cut it close on a bandsaw and use a block plane to get right on my layout line. 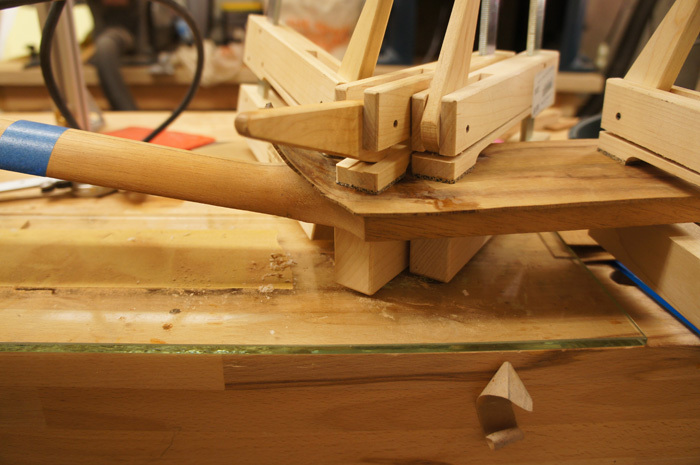 I clamp the wedge on the rim where I want it and use an exacto knife scribe two lines. 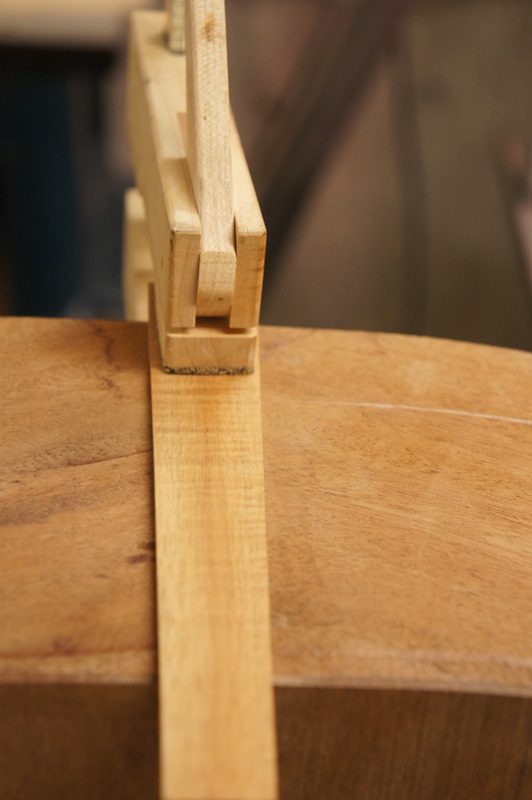 I then clamp a block right on the outside of the scribed line and use it as a guide to cut the shape of the wedge into the rim. I hand chisel out the waste. 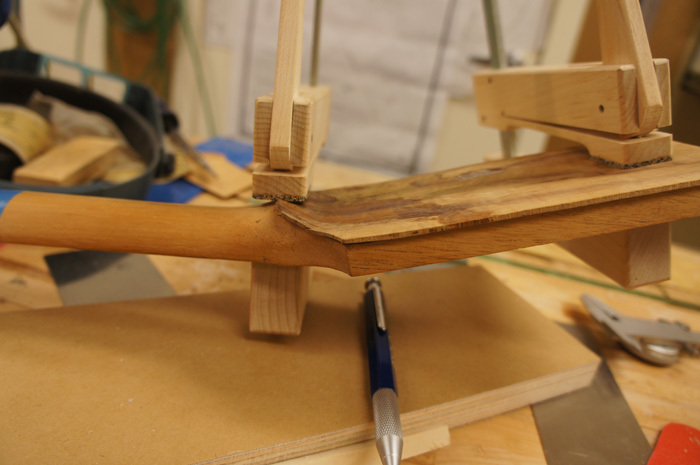 The wedge is tight enough when pushed in not to use clamps while gluing, but I still used a couple of clamps just to make sure it was down. 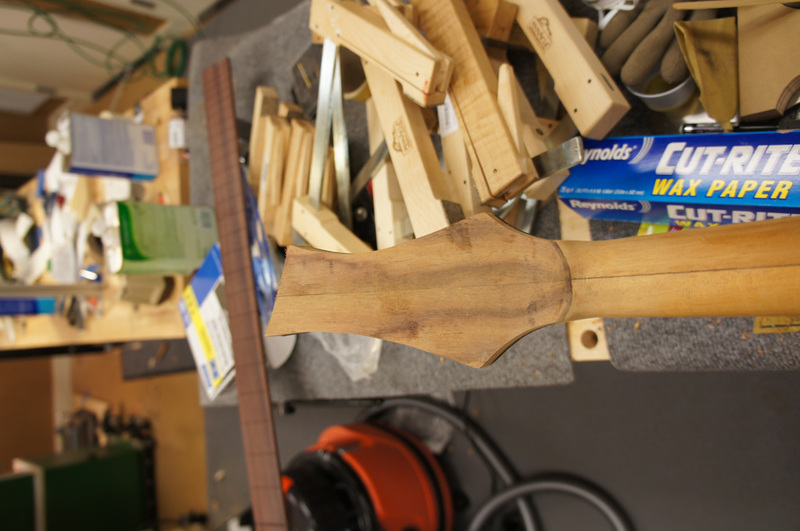 This is the first time I have added a veneer to the back of the headstock. 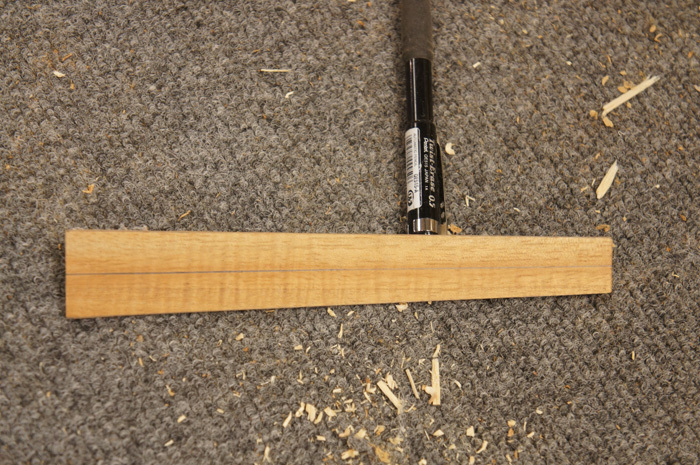 The neck that I got in the kit has a curved up ridge in the back requiring me to bend the veneer. Also I had a nice booked matched bit of koa from a previous guitar that I decided to use to match my end wedge and the heel cap. The pictures I am showing makes the process look easy, but I do not show the book match veneer seperating from the heat, planing and sanding the glue edge of the veneers to get a good joint and aligning the curved pieces to glue them back together. Next time I think I will use a nice one piece veneer to do this. 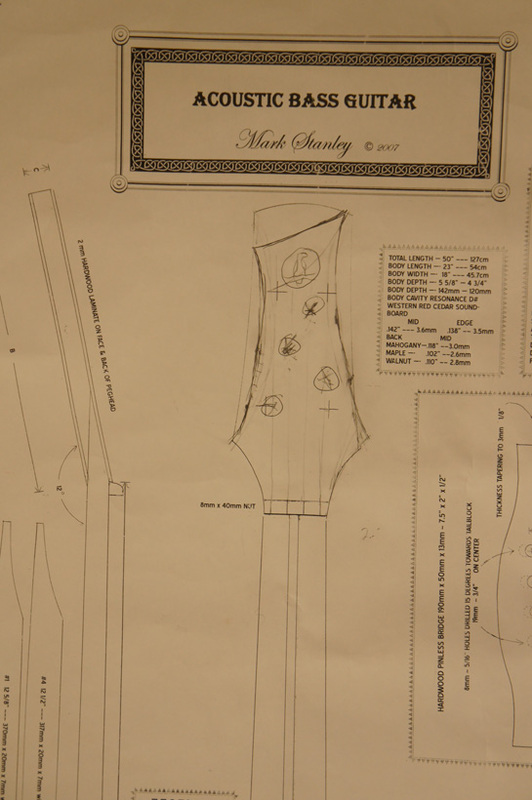 I went ahead and profiled the headstock. It was a scary enough operation that I think I will stop today.